It was Napolean Bonaparte who once grandly announced, “I would rather suffer with coffee than be senseless.” Sir James MacKintosh, 18th century philosopher famously said, “The powers of a man’s mind are directly proportional to the quantity of coffee he drank.” In The Love Song of J Alfred Prufrock, when TS Eliot revealed, “I have measured out my life with coffee spoons” he hinted at the monotony of socializing and the coffee mania of the 1900s. German musical genius JS Bach composed the Coffee Cantata celebrating the delights of coffee at a time when the brew was prohibited for women. “If I couldn’t, three times a day, be allowed to drink my little cup of coffee, in my anguish I will turn into a shriveled-up roast goat,” cried the female protagonist! French author Honoré de Balzac wrote the essay The Pleasures and Pains of Coffee to explain his obsession, before dying of caffeine poisoning at 51. Like Voltaire, he supposedly drank 50 cups a day! So what was it about coffee that inspired poets, musicians and statesmen alike? Long before coffee houses around the world resounded with intellectual debate, business deals and schmoozing, the ancestors of the nomadic Galla warrior tribes of Ethiopia had been gathering ripe coffee berries, grinding them into a pulp, mixing it with animal fat and rolling them into small balls that were stored in leather bags and consumed during war parties as a convenient solution to hunger and exhaustion! Wine merchant and scientific explorer James Bruce wrote in his book “Travels to Discover the Source of the Nile” that ‘One of these balls they (the Gallas) claim will support them for a whole day… better than a loaf of bread or a meal of meat, because it cheers their spirits as well as feeds them’. Other African tribes cooked the berries as porridge or drank a wine prepared from the fermented fruit and skin blended in cold water. It was only a matter of time before the exotic flavours of this intoxicating beverage captured the imagination of Europe, prompting colonial powers like the Dutch, French and the British to spread its cultivation in the East Indies and the Americas. Enterprising Dutch traders explored coffee cultivation and trading way back in 1614 and two year later, a coffee plant was smuggled from Mocha to Holland. By 1658 the Dutch commenced coffee cultivation in Ceylon (Sri Lanka). The word ‘coffee’ is apparently derived from qahwah (or kahveh in Turkish), the Arabic term for wine. Both the terms bear uncanny similarity to present day expressions – French café, Italian caffè, English coffee, Dutch koffie or even our very own South Indian kaapi. A few scholars attribute ‘coffee’ to its African origins and the town of Kaffa in Ethiopia, formerly known as Abyssinia. However the plant owes its name “Coffea Arabica” to Arabia, for it was the Arabs who introduced it to the rest of the world via trade. As all stories of good brews go, coffee too was discovered by accident. Legends recount how sometime around the sixth or seventh century, Kaldi, an Ethiopian goatherd observed that his goats became rather spirited and pranced after they chewed on some red berries growing in wild bushes. He tried a few berries and felt a similar euphoria. Excited by its effects, Kaldi clutched a handful of berries and ran to a nearby monastery to share his discovery with a monk. When the monk pooh-poohed its benefits and flung the berries into the fire, an irresistible intense aroma rose from the flames. The roasted beans were quickly salvaged from the embers, powdered and stirred in hot water to yield the first cup of pure coffee! This story finds mention in what is considered to be one of the earliest treatises on coffee, De Saluberrima Cahue seu Café nuncupata Discurscus written by Antoine Faustus Nairon, a Roman professor of Oriental languages, published in 1671. Coffee drinking has also been documented in the Sufi monasteries of Yemen in South Arabia. Arabic manuscripts dating back to the 10th Century mention the use of coffee. Mocha, the main port city of Yemen was a major marketplace for coffee in the 15th century. Even today, the term ‘mocha’ is synonymous with good coffee. Like tea and cocoa, coffee was a precious commodity that brought in plenty of revenue. Hence, it remained a closely guarded secret in the Arab world. The berries were forbidden to leave the country unless they had been steeped in boiling water or scorched to prevent its germination on other lands. In 1453, the Ottoman Turks brought coffee to Constantinople and the world’s first coffee shop Kiva Han opened for business. As its popularity grew, coffee also faced other threats. 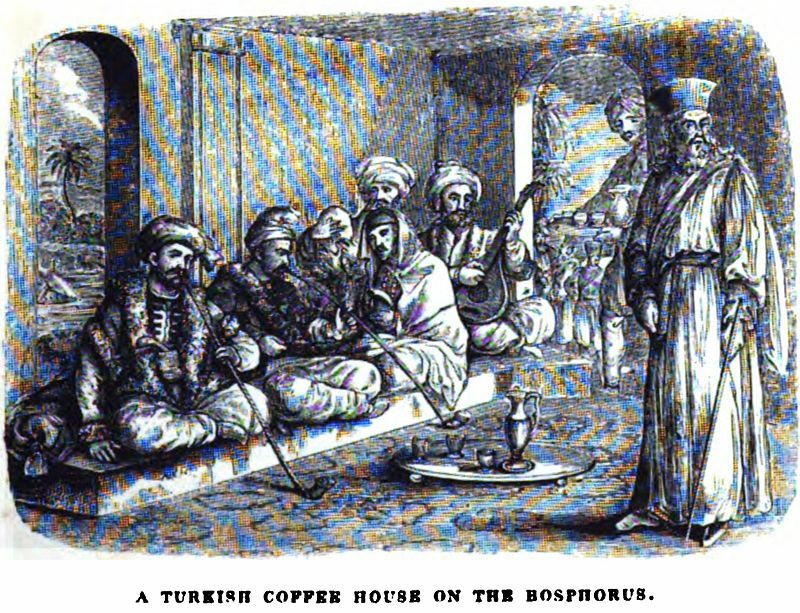 The psychoactive and intoxicating effects of caffeine lured menfolk to spend hours at public coffee houses drinking the brew and smoking hookahs, which incited the wrath of orthodox imams of Mecca and Cairo. As per sharia law a ban was imposed on coffee consumption in 1511. The Grand Mufti Mehmet Ebussuud el Imadi was hailed when he issued a fatwa allowing the consumption of coffee, by order of the Ottoman Turkish Sultan Selim I in 1524. Though subsequent bans were re-imposed and lifted at various points of time according to the whims of religious politics and power, coffee pots managed to stay constantly on the boil in secret or in the open for those desirous of its potent influence. Given the fact that Sufi saints advocated its uses in nighttime devotions and dervishes and Pope Clement VIII even baptized the bean to ward off the ill effects of what was regarded by the Vatican as ‘Satan’s drink’ and the ‘Devil’s Mixture of the Islamic Infidels’ till the 1500s, it is easy to see why coffee is nothing short of a religion to some people. Surprisingly, India’s saga with coffee began in 1670 when a Muslim mystic, Hazrat Dada Hyat Mir Qalandar, popularly known as Baba Budan, smuggled seven beans from Arabia and planted them on a hillock in Chikmagalur district of Karnataka. The hills were later named Baba Budan Giri in his memory. From here, coffee spread like bushfire across the hilly tracts of South India. In 1696 Adrian van Ommen, the Commander at Malabar followed orders from Amsterdam and sent off a shipment of coffee plants from Kannur to the island of Java. The plants did not survive due to an earthquake and flood but the Dutch pursued their dream of growing coffee in the East Indies with another import from Malabar. In 1706, the Dutch succeeded and sent the first samples of Java coffee to Amsterdam’s botanical gardens from where it made further inroads into private conservatories across Europe. Not wishing to be left behind, the French began negotiating with Amsterdam to lay their hands on a coffee tree that could change their fortunes. In 1714, a plant was sent to Louis XIV who gave it promptly to the Jardin des Plantes at Paris for experimentation. The same tree became the propagator of most of the coffees in the French colonies including those of South America, Central America and Mexico. The importance of coffee in everyday life can be gauged by the fact that its yield forms the economic mainstay of several countries across the world; its monetary worth among natural commodities beaten only by oil! It was only in 1840 that the British got into coffee cultivation in India and spread it beyond the domain of the Baba Budan hills. Kodagu and Chikmagalur are undoubtedly the best places to know your Arabica from your Robusta and any planter worth his beans will trace coffee’s glorious history with pride. The strain that Baba Budan got was Coffea Arabica and because of its arid origins, it thrived on late rainfall. Despite its rich taste and pleasing aroma, the effort required to cultivate it dented its popularity. The high-altitude shrub required a lot of tending, was susceptible to pests and ripe Arabica cherries tended to fall off and rot. Careful monitoring at regular intervals affected production cost and profitability. Till 1850, Arabica was the most sought-after coffee bean in the world and the discovery of Robusta in Belgian Congo did little to change that. Robusta (Coffea Canephora), recognized as a species of coffee only as recently as 1897, lived up to its name. Its broad leaves handled heavy rainfall much better and the robust plant was more disease-resistant. The cherries required less care as they remained on the tree even after ripening. Its beans had twice the caffeine of Arabica, though less flavour, which was no match for the intense Arabica. It was perceived as so bland that the New York Coffee Exchange banned Robusta trade in 1912, calling it ‘a practically worthless bean’! But in today’s new market economy, the inexpensive Robusta makes more commercial sense and is favoured for its good blending quality. Chicory, a root extract, was an additive that was introduced during the Great Depression to combat economic crisis that affected coffee. It added more body to the coffee grounds and enhanced the taste of coffee with a dash of bitterness. Though over 30 species of coffee are found in the world, Arabica and Robusta constitute the major chunk of commercial beans in the world. ‘Filter kaapi’ or coffee blended with chicory holds a huge chunk of the Indian market. Plantations started with Arabica, toyed with Liberica, experimented with monkey parchment and even Civet Cat coffee (like the Indonesian Luwak Kopi –the finest berries eaten by the civet cat that acquire a unique flavour after passing through its intestinal tract), but the bulk of India’s coffee is Robusta. As the coffee beans found their way from the hilly slopes of the Western Ghats to the ports on India’s Western Coast to be shipped to Europe, a strange thing happened. While being transported by sea during the monsoon months, the humidity and winds caused the green coffee beans to ripen to a pale yellow. The beans would swell up and lose the original acidity, resulting in a smooth brew that was milder. This characteristic mellowing was called ‘monsooning’. And thus was born Monsooned Malabar Coffee. Currently, Coorg is the largest coffee-growing district in India and contributes 80% of Karnataka’s coffee export. It was Captain Lehardy, first Superintendent of Kodagu, who was responsible for promoting coffee cultivation in Coorg. Jungles were cleared and coffee plantations were started in almost every nad. In 1854, Mr. Fowler, the first European planter to set foot in Coorg opened the first estate in Madikeri followed by Mr Fennel’s Wooligoly Estate near Sunticoppa. The next year one more estate in Madikeri was set up by Mr Mann (after whom the Mann’s Compound is named). In 1856, Mr Maxwell and Mcpherson followed, with the Balecadoo estate. Soon, 70,000 acres of land had been planted with coffee. A Planters Association came into existence as early as 1863, which even proposed starting a Tonga Dak Company for communication. By 1870, there were 134 British-owned estates in Kodagu. Braving ghat roads, torrid monsoons, wild elephants, bloodthirsty leeches, hard plantation life and diseases like malaria, many English planters made Coorg their temporary home. Perhaps no account of Coorg can be complete without mentioning Ivor Bull. Along with District Magistrate Dewan Bahadur Ketolira Chengappa (later, Chief Commissioner of Coorg), the enterprising English planter helped set up the Indian Coffee Cess Committee in 1920s and enabled all British-run estates to form a private consortium called Consolidated Coffee. In 1936, the Indian Cess Committee aided the creation of the Indian Coffee Board and sparked the birth of the celebrated India Coffee House chain, later run by worker co-operatives. With its liveried staff and old world charm, it spawned a coffee revolution across the subcontinent that has lasted for decades. Connoisseurs say Coorg’s shade grown coffee has the perfect aroma; others ascribe its unique taste to the climatic conditions and a phenomenon called Blossom Showers, the light rain in April that triggers the flowering of plants. The burst of snowy white coffee blossoms rends the air thick with a sensual jasmine-like fragrance. Soon, they sprout into green berries that turn ruby red and finally dark maroon when fully ripe. This is followed by the coffee-picking season where farm hands pluck the berries, sort them and measure the sacks at the end of the day under the watchful eye of the estate manager. The berries are dried in the sun till their outer layers wither away; coffee in this form is called ‘native’ or parchment. The red berries are taken to a Pulp House, usually near a water source, where they are pulped. After the curing process, the coffee bean is roasted and ground and eventually makes its journey to its final destination – a steaming cup of bittersweet brew that you hold in your hands. In India, coffee cultivation is concentrated around the Western Ghats, which forms the lifeline for this shrub. The districts of Kodagu (Coorg), Chikmagalur and Hassan in Karnataka, the Malabar region of Kerala and the hill slopes of Nilgiris, Yercaud, Valparai and Kodaikanal in Tamil Nadu account for the bulk of India’s coffee produce. With 320,000 MT each year, India is the 6th largest coffee producer in the world. Making a good cup of filter coffee traditionally involves loading freshly ground coffee in the upper perforated section of a coffee filter. About 2 tbs heaps can serve 6 cups. Hot water is poured over the stemmed disc and the lid is covered and left to stand. The decoction collected through a natural dripping process takes about 45minutes and gradually releases the coffee oils and soluble coffe compounds. South Indian brews are stronger than the Western drip-style coffee because of the chicory content. Mix 2-3tbs of decoction with sugar, add hot milk to the whole mixture and blend it by pouring it back and forth between two containers to aerate the brew. Some places and brands of coffee have etched a name for themselves in the world of coffee for the manner in which coffee is made. The strength of South Indian Filter coffee or kaapi (traditionally served in a tumbler and dabrah or bowl to cool it down), the purity of Kumbakonam Degree Coffee, the skill of local baristas in preparing Ribbon or Metre coffee by the stretching the stream of coffee between two containers without spilling a drop… have all contributed to the evolution of coffee preparation into an art form. With coffee bars and cafes flooding the market and big names like Starbucks, Costa, Barista, Gloria Jean’s, The Coffee Bean, Tim Horton’s and Café Coffee Day filling the lanes and malls in India along with local coffee joints like Hatti Kaapi jostling for space, it’s hard to the escape the tantalizing aroma of freshly brewed coffee. And to add more drama to the complexities of coffee, you can choose from a host of specialty coffees from your backyard – Indian Kathlekhan Superior and Mysore Nuggets Extra Bold, or faraway lands – Irish coffee and cappuccino (from the colour of the cloaks of the Capuchin monks in Italy) or Costa Rican Tarrazu, Colombian Supremo, Ethiopian Sidamo and Guatemala Antigua. And you can customize it as espresso, latte, mocha, mochachino, macchiato, decaf… Coffee is just not the same simple thing that the dancing goats of Ethiopia once enjoyed. Authors: Anurag Mallick & Priya Ganapathy. This article appeared as Cover Story on 21 Sep 2014 in Sunday Herald, the weekend supplement of Deccan Herald.